On Monday, September 25, 2006, Matthew Macfadyen narrated Part I of a 3 part series on BBC2 called "Nuremberg: Nazis on Trial". 6point7 has posted a teaser in the Pemberworth Forum. We hope to get the full video and audio up soon. Thank you, 6point7 for sharing the teaser with us! Update: All of Part I is available for viewing in the gallery. The audio clips of Matthew's narration have also been added to the galleries. Set in Ireland, this atmospheric and explosive drama tells the tale of one cleric's chilling determination to rid a rural town of its corruption and sin. 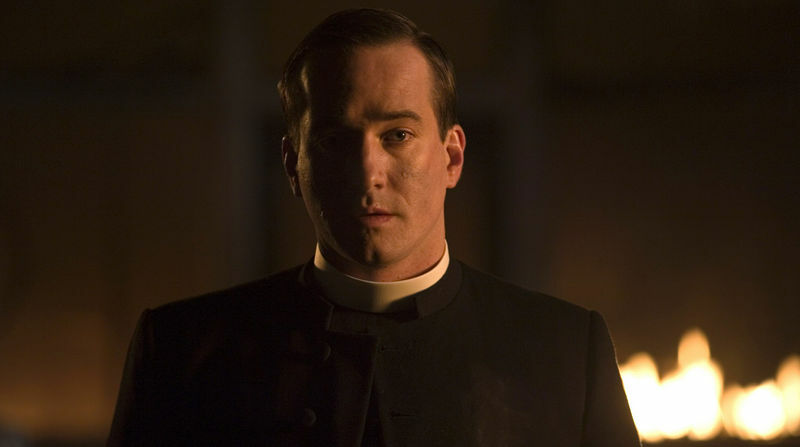 Preacher Gabriel (Matthew MacFadyen) returns home to Middletown and finds the town's inhabitants given over to vice and sin. Determined to save the souls of his flock, he sets about imposing a new order. However, Gabriel's godly intentions mask a dark and malevolent heart with his damning sermons pitting neighbour against neighbour. Even Gabriel's own family are not free from attack - his younger brother Jim (Daniel Mays) and wife (Eva Birthistle) are first to suffer his moral crusade as Gabriel cannot bring the town back to the true path unless he achieves that for his own kin. Middletown presents a haunting story of good versus evil. Has the preacher come to save them all from eternal damnation or condemn the parishioners to a life of hell? Directed by BAFTA-nominated Brian Kirk, produced by award-winning Michael Casey and written by hot new talent Daragh Carville, Middletown stars a stunning ensemble of Ireland's acting talent including Gerard McSorley, Mick Lally, David Wilmot, Frankie McCafferty, Bronagh Gallagher and Marie Jones. The director Brian Park will introduce the film and be in conversation with filmmaker D W Mault after the film. Visit the galleries to see the high res images. Here are the production notes in entirety. A modern-day western about God, man and the madness in between. In the context of a single family, in a single place, it tackles the issues of the fundamental versus the secular which so dominate the world we live in today. Middletown is an explosive tale of the ambition and betrayal threatening to tear one family apart forever. If it was a song, Johnny Cash would have written it. According to BBFC Middletown receives a 15 rating and is to open in the UK on November 24, 2006. I was looking at the latest gallery statistics and was delighted to see we had passed the 4000 image mark. Cubbie and I have also put together a list of every Matthew related item that is currently available to buy. You will be able to buy cheaper in places other than Amazon, but at least you know what can be bought online to add to your Matthew collection!